After Justin and Linda Tyers lost everything in a devastating house fire, they rebuilt their lives by building a classic wooden yacht from scratch - starting by felling the trees. This story was told in their first book, Phoenix from the Ashes. This sequel follows their voyage from the Scottish Islands across to Ireland, down the Irish Sea to Cornwall and thence to Brittany, meeting interesting, curious and larger-than-life characters along the way. Justin has an unceasing ability to attract the nearest eccentric wherever he goes, a brilliant eye for natural humour in any situation, as well as a wonderful, lyrical turn of phrase. The audiobook is peppered with amusingly told anecdotes of everyday cruising life and packed with the kind of inevitable dramatic incidents that happen when you have two inexperienced sailors trying to man a yacht that’s really too big for them: running aground, losing a guest overboard and almost being shipwrecked - more than once. This is not a tale of intrepid on-the-edge sailing; it is a gentle, endearing and frequently amusing account of the sort of voyaging most cruisers can relate to and will greatly appreciate. ©2014 Justin Tyers (P)2014 Audible Inc.
EA series of story pictures that left me with the feeling the author had had a hard time deciding what to leave out. Great sailing/cruising inspiration. I usually listen to books when commuting, to keep my mind off things. But I found myself sitting at home just listening wantonly. The writing and performance are really good, more to the point, perfectly matched. If you like sailing you will want to go out today. But beware, if you ever so much as looked at a sailboat with a smile on your face you may feel the urge to cast your lines and seek new adventures. 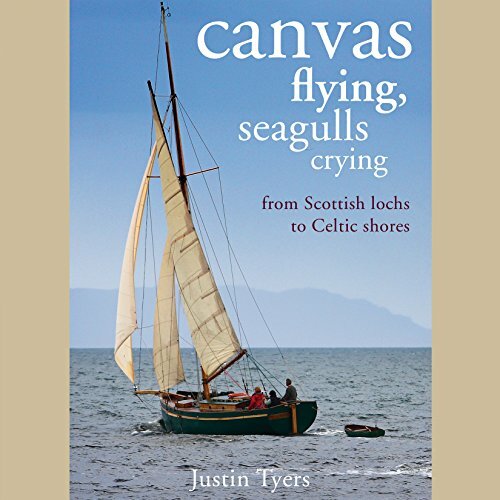 A really enjoyable, beautifully written story about a couple who sail aimlessly around scotland Cornwall and France. Some of the comedic moments (and there are plenty) rival vintage wodehouse for their barking characters and pithy one liners. a real treat. I'm off to download book one now, which explains how they came upon this lifestyle in the first place. I can't wait!